This striking son of multi supreme champion Douthwaite Signwriter has quality, athleticism and very correct conformation, everything you would expect in an outstanding performance pony stallion. His pedigree includes some of the best Welsh bloodlines renown for producing not only supreme champion show stock but also top class competition/ performance ponies. Signature is a very sweet pony with a great character, extravagant paces and a superb temperament. He is very much a people pony and is regularly handled at home by children. This must surely be a testament to his genuine nature and incredible potential to sire fantastic children’s ponies. 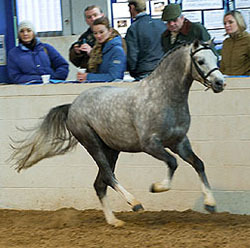 Signature's sire, Douthwaite Signwriter, is a multiple supreme champion, who qualified for the Horse of the Year Show four times before retiring from the show ring. Signwriter's progeny won the progeny points for the Welsh Ponies Section B at the 2003 Royal Welsh Show. Signwriter's sire, Twyford Signal, stood at the Llanarth Stud for 20 years and during his showing career in-hand he qualified for the Horse of the Year Show four times and under saddle he qualified twice for the Supreme Ridden Event at Olympia, London. His offspring have carried on his success. A daughter has been Champion Female at The Royal Welsh Show and a son was Champion at the World Centenary Show. 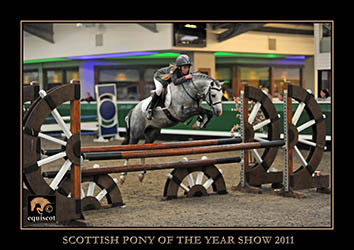 Signal’s progeny won the Progeny award for the Welsh Ponies Section B at the World Centenary Show. Rotherwood Half a Penny is also the dam of Rotherwood Royal Parade NCPA 2006 Yearling Hunter Pony Champion, NCPA Notts/Lincs 1st & Reserve Champion Yearling Hunter Pony. Half a Penny's dam, Rotherwood Miss Money Penny, is full sister to Rotherwood Casino Royale who is arguably the most successful and best bred stallion currently standing in Australasia. As a stallion his progeny have achieved success in New South Wales and Victoria at all the Royal as well as the Breed Shows of the Riding Pony Stud Book Society and Welsh Pony and Cob Society. Miss Moneypenny is also half sister to Rotherwood Spycatcher. Miss Moneypenny's dam, Rotherwood Penny Royale, was from a long line of champions and full sister to Rotherwood State Occasion. Her sire Keston Royal Occasion needs no introduction as one of the most influential sires within the recent history of the Welsh breed and perhaps the most pre-eminent sire of Welsh and Riding Ponies in Australia and the United Kingdom. 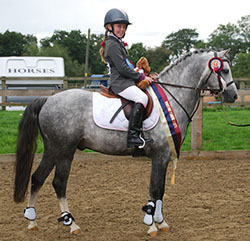 Desarbre Streetfighter has won consistently since being a youngster, both in-hand breed classes and ridden in working hunter mountain and moorland classes. He is a great jumper and very athletic his results include: Winner of performance award Ponies UK 1995; qualified for Olympia and won Best of Breed 1995; winner of Glynn Greenwood Championship of all Mountain and Moorland breeds at Ponies UK 1994; Champion Great Yorkshire Show, Scottish M&M ‘Pony of The Year’, Reserve Champion Open working hunter and novice champion M&M WHP NPS Scottish Horse Show. Streetfighter's dam, Delio Annis, was up to height with good bone and substance and was a winner of many awards. Her pedigree goes back to the true Welsh Mountain Pony through Coed Coch Madog. 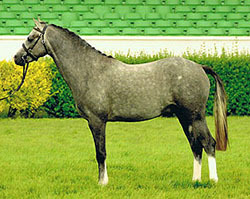 Streetfighter's sire, Wingrove Titlight, was by the famous Downland Chevalier who possessed great type and breed character. 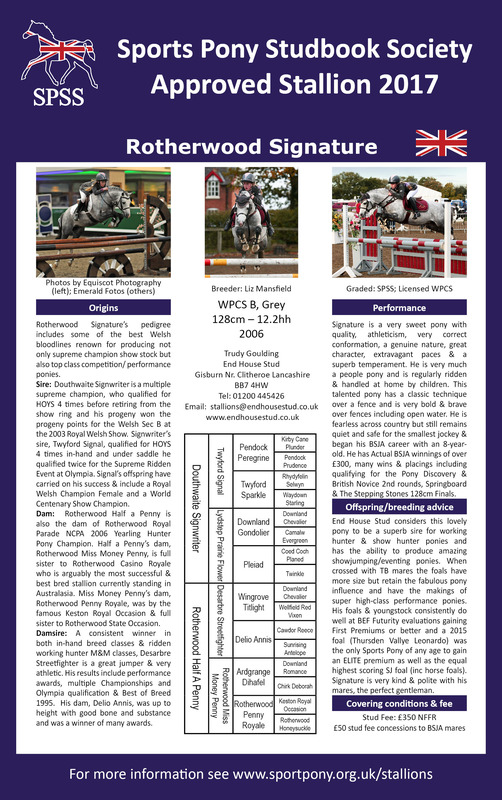 Rotherwood Signature was lightly shown at county level as a youngster with good results, taking everything in his stride and never being fazed by big shows and stabling away from home. In Autumn 2008, he attended The Sports Pony Society annual Broodmare & Youngstock Show achieving an SPSS first Premium scoring 10/10 for his head and neck, 9.5/10 for shoulder/body/overline & 9/10 for limbs/feet – the judges comments included "fantastic and lots to like". He was backed and ridden away in Autumn 2009 proving to be a calm and sensible ride, 100% in the heaviest of traffic and regularly hacking out in the company of mares and other stallions. 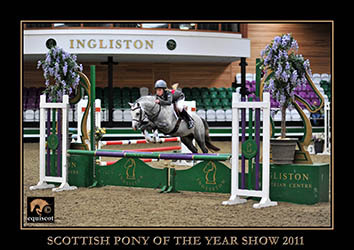 In Autumn 09 he also competed at Ingliston House Equestrian Centre's International Pony Of The Year Show in the Scottish Sports Horse 3 year old pony Loose Jumping Championships. 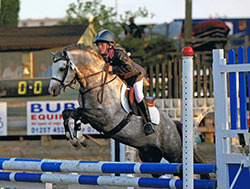 He was judged and assessed by two International Showjumping judges who scored him 8/10 for scope, technique and suitability. With the highest score in his section (13 hands & under), he then went on to take Reserve Champion in the final as well as winning the best turned out prize – a huge bottle of champagne!! The judges commented on his great temperament and aptitude for showjumping. 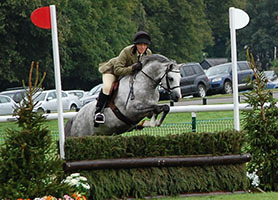 Later reports by the Scottish Sports Horse described him as "a beautiful grey colt "
In March 2010, Signature began his ridden career with 13 year old Jack Starkie. First time out he qualified for Ponies UK Winter Championships in the Confined Novice and Open Horselode mixed height M&M WHP classes. 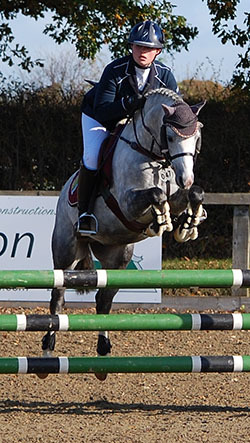 He has consistently jumped double clears showjumping and in Open WHP classes and has also competed at dressage, narrowly missing out on qualifying for The NPS Dressage Championships at Addington Manor. 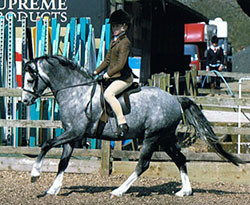 Judges described him as a "talented pony with super rhythmic paces - the perfect child's pony". In October 2010 he was presented at the SPSS Stallion Grading, not only passing with flying colours but achieving Reserve Champion placing. 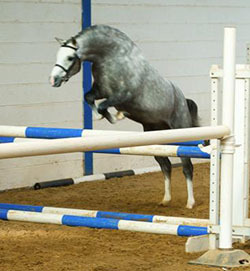 He also fulfilled the British Showjumping grading requirements for Competing Pony Stallions. This talented pony shows such a classic technique over a fence when loose jumping and under saddle - so good that in time he will be produced a show jumping pony stallion as well. 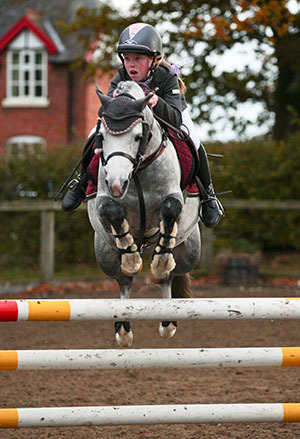 In 2012, as Maisey was too young to ride a stallion in Mountain and Moorland showing classes, Anne Hartley took over the ride for the summer so that Signature could do Working Hunter Pony (WHP) classes. At Trawden Agricultural Show, Anne and Signature not only won the Open M&M Small Breeds WHP class but were also 3rd in the Puissance - which is a significant achievement for a 128cm pony when the puissance wall was 1m in the first round and he cleared not only cleared it then, but also at 1.10m and 1.20m before just knocking a brick out at 1.25m, so he nearly cleared his own height! Having qualified in June for the prestigious P(UK) Burghley Event Pony Final, which is held during the Burghley Horse Trials at the beginning of September, Anne and Signature did a good clear round over the combined show jumping and cross country course to finish 11th, a great result as most of the class were the larger M&M breeds and so Signature was one of the smallest ponies in the class and the fence heights were the same for all entrants. Signature then successfully defended his title at the 2012 SPSS Open Young Jumping Pony Championships in October, unfortunately, Maisey was ill just before the show, so was unable to ride but Junior Showjumper Lara Whiteway substituted at the last minute and Signature was Top 6 Year Old and Overall Champion. 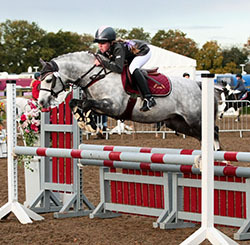 In 2013, Maisey continued to compete Signature in British Showjumping classes and they had many wins and placings including qualifying double clears for the Pony Discovery Second Round, Springboard 128cms Final, Pony British Novice Second Round and the Stepping Stones 128cm Final. 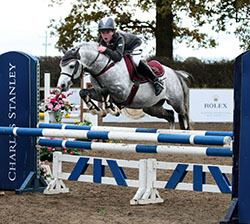 End House Stud considers this lovely pony to be a superb sire for working hunter ponies, show hunter ponies and have the ability to produce amazing showjumping/event ponies. 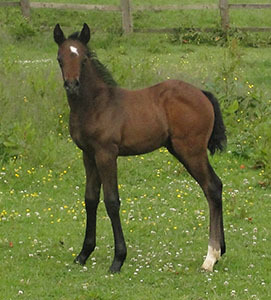 His first crop of foals were born Spring 2010 from mares ranging from Welsh Section A Lead Rein ponies to small Thoroughbred mares and End House Stud were delighted with his first crop. 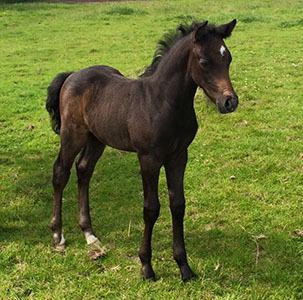 When crossed with TB mares the foals have more size but retain the fabulous pony influence and have the makings of super high-class performance ponies. One of his foals, Goodenbergh Sovereign, whose dam is of unknown breeding but Section A type, gained a Higher First Premium at the BEF Futurity Evaluations in Sports Pony Foal Section and scoring Reserve Champion in the overall Showjumping Foal section. Then as a 2 year old, Sovereign gained another Higher First Premium and was not only the highest scoring 2 year old show jumper on the day but finished the year as 4th highest placed 2 year old across venues and all entrants (horses & ponies). Signature is very kind and polite with his mares, the perfect gentleman.